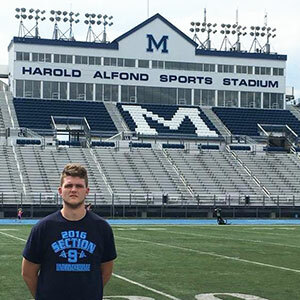 Brendan Egan at University of Maine, where he has accepted a full tuition athletic scholarship to compete for the Maine Black Bears of NCAA Division I Colonial Athletic Association. Warwick graduate Brendan Egan signed a National Letter of Intent on Wed., July 12 to attend the University of Maine on a full tuition scholarship and play football for the Black Bears. Maine competes in the Colonial Athletic Conference and will play Delaware, University of Central Florida, Villanova and New Hampshire this season, which including a game at Fenway Park vs. U Mass. Egan was a three-year starter and first team All State Selection as an Offensive Lineman his senior year. He was recruited by Joe Harasymiak, Head Coach at Maine who loved Brendan’s competitiveness and aggressive nature on the field (Egan is 6’6” 289 lbs.). Brendan Egan will have an opportunity to play on Sundays as he continues to develop as a football player. Congratulations to Brendan Egan and the Egan family on an exciting next chapter in education and life – well deserved!